Aquatic plants can add accent and color to ponds and water features. There are four categories: algae, floating plants, submerged plants, and emerged plants. 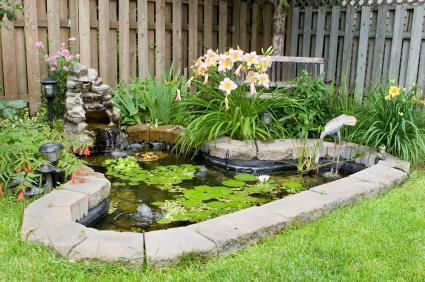 Look for plants that create the design you desire in your pond or water feature. Choose plants from several categories to create an eye-catching design for your garden pond. Algae are very primitive plants that almost no one wants in their pond or water feature. They range from microscopic to larger plants that almost appear to be floating plants, but without true roots. Algae sustain fish and other wildlife in the pond or water feature but are unattractive and usually unwanted. These plants float on the surface of the water and do not have roots reaching the bottom of the pond or water feature. They range in size from small, such as duckweed, to very large, such as water hyacinth. In most cases, they have roots that hang from the floating portions of the plants. These plants are firmly rooted in the bottom of the water feature or pond. Usually, they are entirely under water, although they may have some parts that stick out of the water. They have very flaccid and soft stems that do not support them out of the water. Examples of these plants are fanwort and eelgrass. These plants are often along the shoreline. They are rooted in the bottom of the water feature or pond but extend above the surface of the water. There stems are firm. An example of this is cattails, which grow along the shore of the pond. The category of an aquatic plant influences its needs. For example, water lilies are emergent plants and require mud or some other soil to grow in. They would not be a good choice for a stone water basin. However, duckweed would grow nicely in such a place. At LoveToKnow Garden, you'll find plenty of suggestions for aquatic plants. The team of experts is frequently researching and writing new articles that will help you create the water feature of your dreams. No matter what plants you want to include in your design, you're sure to find the information you seek here.